The one of the most important Exam for Job Seekers is SSC Combined Graduate Label Exam. A few days ago SSC releases their notice for the various post on Graduate Label. Most of the students waiting for this Exam. Hope, you are stating practice daily for SSC CGL Exam. Online Notes, model practice set help you better practice. Today GK Solve share SSC Combined Graduate label Tier-1 Exam model practice set download link. This practice set made by popular institute Jibika Dishari. In this pdf, you can get syllabus wise model question answer. 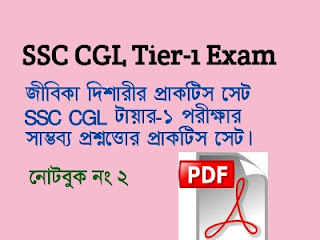 So all the candidates are requested to download this SSC CGL Tier-1 Exam pdf practice set as soon as possible and start practice right now.